Keeping fit is almost a herculean task these days. While a lot of us desire to stay in good shape and work out, the task of going to the gym, signing up, and spending hours on end there just seems too arduous. This is why trampolines were created. They focus on building your cardio, providing just as much exercise as you can get from a gym from the comfort of your home, and they eliminate toxins from the body. A lot of exercises can also be modified to be done on a trampoline, with activities such as jumping jacks and squats, as examples suitable for the trampoline. 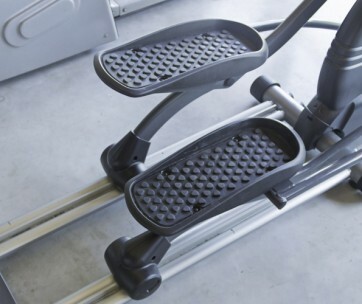 There are way more benefits that you stand to gain from owning one of these fantastic exercise tools in your home. So, here’s a quick roundup of the fitness trampolines that would give you the best bang for your buck in today’s market. The Stamina Folding Trampoline focuses on the importance of rebounding and how it helps to improve cardiovascular health. What’s impressive about this product is the number of features pumped into it to boost your bounce, thereby giving you an immersive exercise experience. The mini-trampoline has a heavy-duty surface, which can support weights up to 250 lbs. There are also thirty tension bands that ensure safety upon each bounce. In addition to this, the trampoline comes with a border safety skirt, which is quite handy when you jump, protecting both your fingers and feet. When you look at the total makeup, it’s safe to say that the manufacturers put a premium on safety while designing this trampoline. The 36-inch folding trampoline has a sturdy steel frame, as well as six detachable rubber-tipped legs that offer a reliable foundation for your rebounding exercises. It also makes a perfect fitness gift for your loved ones. The makers tout the Urban Rebounder Trampoline as a fun workout that can improve muscle growth and sculpt lean muscles. The trampoline can be set up in two positions; elevated and flat. However, you don’t need to worry about either one, as both the positions make for an effective workout. The Urban Rebounder Trampoline has eight legs, providing even more safety and stability than the option above and it’s heavy-duty—with the ability to hold up to a whopping 300 lbs. in weight. When you purchase a trampoline, you want to be sure you can get it off the box and set it up in some few minutes. The Urban Rebounder ticks this box perfectly. You won’t find any need of joining numerous parts together or to read through copious manuals. You can get it up and ready to go under 10 minutes. Some customers have, however, complained about the stability of the trampoline. It’s said to have an unstable frame, while others have knocked it for its durability. Also, the plastic bags covering the entire unit tends to make the product give off a plastic smell when you unbox it. However, after a few days, you’ll no longer have this issue. 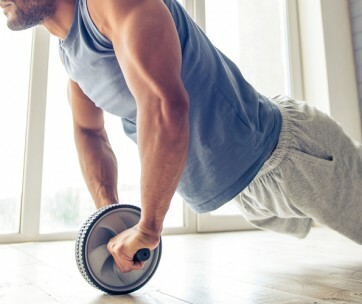 If you love working out, check out our guide to the best ab machines as well. Load capacity of 300 lbs. Another excellent product from Stamina, the Intone Plus Rebounder is a trampoline that emphasizes size and functionality. The jumping surface on this option is made from polypropylene, which makes it sturdy and durable. Just like the options above, it comes with a max. weight of 250 lbs, which is like the standard weight limit. Interesting as these might be, one super nifty feature that you get with this trampoline is the addition of resistance tubes and an electronic monitor. The resistance tubes help you build strength in your arms and also provide a wider variety of exercise options. What you get with this trampoline is an all-encompassing workout routine. There are blue outlines on the Stamina 38-inch, useful to direct you on your jump area, and the surface (which, by the way, measures 38 inches) should not be a problem. If you are into resistance training, check out our guide to the best resistance bands. Max weight of 250 lb. This Pure Fun trampoline is unique and targeted for outdoor use. It has a standard weight limit of 250 lbs., which is by no means a unique feat. However, the springs on this baby are a big deal. By all standards, the spring is heavy-duty. Then, you get a jumping surface on it that measures 28 inches in diameter. It provides the right amount of space for you to jump and bounce, but it comes short of some of the other options we’ve reviewed here that had 38-inches. The spring pad on this trampoline is cushioned, which is a good thing. Beyond aesthetic and how comfortable it would be, the pads will also protect your feet from coming in contact with the springs on the trampoline. Moving on, the trampoline provides 32 8.5-inch springs, all of which are made from solid galvanized steel. They, as well as the polypropylene jumping mat, make the bounce much enjoyable for that effective workout that we all crave. The primary issue with the Pure Fun Mini is that its size doesn’t make it suitable for indoor use. Be sure to also check out our list of the best stepper machines for more great items like this. Maximum weight capacity is 250 lbs. The Marcy Trampoline Cardio Trainer is sleek and portable. 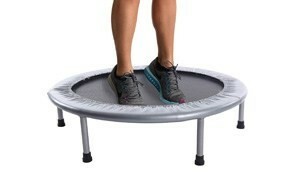 It measures about 21 pounds in weight, which is way more than the average trampoline. Moving it around might be a problem, but once you get it settled, you’ll find it interesting to use. Perhaps, the most innovative feature in the Marcy Cardio Trainer is the inclusion of a handlebar. With this, you can get more flexibility, balance, and coordination while you work out your routine. The durability of the trampoline is also quite admirable. Its surface is strong enough to hold up to 250 lbs. in weight, and the complete construction of the trampoline looks neat and durable. The trampoline comes with six separate legs—similar to the Stamina 36-Inch— and continuous rebound bands. However, while it does look compact enough to be put anywhere, you might not be able to fit it into your room because of the handlebar. You also need to be careful with the folding mechanism on the trampoline. It could get rusty with time, and it can close accidentally in a snap and injure your fingers. 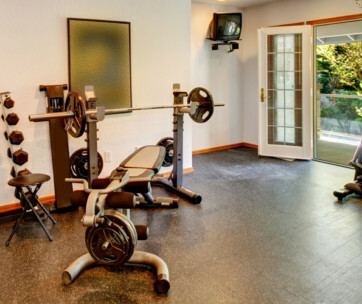 This also makes a perfect gym equipment for your home. Max load capacity of 250 lbs. The JumpSport 250 Fitness Trampoline comes almost fully assembled. Setting up is as easy as it gets, and you will be jumping within a few minutes after unboxing it. The trampoline also makes use of bungee cords as opposed to steel springs, providing a much safer alternative with the same level of efficiency when bouncing. With the JumpSport 250, the manufacturers chose a different type of design specification with this one. As opposed to using the conventional leg design, this trampoline has an arched leg build for added durability. The tip here is absent, while everything is balanced, allowing you to engage in a painless workout. The jumping surface of this product is made from a padded metal mat, and it measures 1030 square inches. There are also 30 EldoroLast cords on the trampoline, which improve bouncing ease. Sadly, this trampoline weighs an incredible 22 pounds. While its features are all premium, we’re not a big fan of the increase in weight. Our handy guide to the best agility ladder features more great products like this. 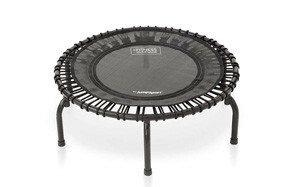 JumpSport gets a second nod on our list with the Fitness Trampoline Model 220. The Model 20 might is not a high-end option from the manufacturer, but its aesthetic appeal of this trampoline makes it an eye turner on our list. Add this to the 250 lbs. weight capacity limit, and we have an average trampoline that you might want to check out. At 39 inches in diameter, this adult trampoline isn’t the smallest of the bunch. That magic middle seems to work pretty well for it. However, it’s not the largest as well. The design of this trampoline’s legs is similar to the JumpSport 250; which is arched with flat tips that help improve stability and safety while you bounce away. You also get free instructional DVDs for both beginners and professional workouts in the package. Sadly, there’s a significant downside to this trampoline. Its bounce cords are not known to be durable, and this could prove a bit dangerous for you. You sure don’t want the cords to fail on you mid-bounce. Barring that, this product is a solid option nonetheless. Love this product? Check out our review of the best exercise bikes for our top picks. Max weight of 250 lbs. This is mini trampoline is smaller than other options reviewed in this guide. The jumping mat measures 33 inches in diameter, but it still makes up for this medium size (in case you don’t like that) by providing 286 lbs. in maximum load capacity. Compared to a lot of other options on here, this is a solid fitness trampoline by all standards. It comes with 36 bungee ropes and bungee net cover, offering protection for adults and kids as they jump around. The fitness trampoline is quiet during use, so you can train without waking up your households or neighbors. The Sportplus trampoline provides the classic adjustable handrail that ensures effective rebounder exercises. The handrail can be extended from 33 to 47 inches. Once you’re done, you can detach the handle and fold it along with the trampoline for quick storage. Sadly though, for all of these features, you might have to put in some work when setting it up. Also, the rubber feet might be on the wrong side of the leg tube, so you will need to spend some time reading the instructional manual before you can begin making use of the trampoline. Find more great products like this by checking out our guide to the best elliptical machines. Max load capacity of 286 lbs. Made of heavy-duty polypropylene, this trampoline has a jumping mat that is capable of supporting 220 lbs. in weight. But, it has other things going for it. For instance, while the handlebar is a pretty standard feature in fitness trampolines, there is an additional pad on this product’s handlebar and the frame cover, so you feel even more comfortable and secure while holding it. The additional padding also provides extra grip and helps you control your balance. The manufacturers provided a detailed manual for setting it up, but don’t let that deter you; setting this product up should not consume more than 10 minutes. Once you buy the SereneLife Portable, you get the full kit bag, so you don’t need to make any additional purchases. While this trampoline might be easy to assemble, disassembling it might take a little bit of physical work. It’s foldable, but you will need to do a little bit of tearing down to pack it up. Don’t forget to also check our guide to the best adjustable workout benches. Max load capacity of 220 lbs. PLENY 2-in-1 Dip Station and Trampoline is a versatile trampoline that can be used by the whole family. It also doubles as a dip bar fitness station, which makes a strong case for why this product should be on this list. This product works for both kids and adults. 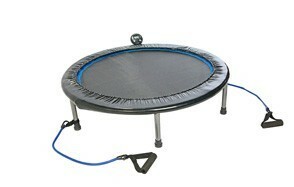 As a standalone trampoline, this equipment is not a bad option to have around. It measures 40 inches in its diameter, although you’ll be impressed by its 300 lbs. weight capacity for trampoline and 500 lbs. for the dip bar use. Your kids can use it to have fun; adults can perform tricep dips and back rows on it and more. Max. weight capacity of 300 lbs. Exercise trampolines are fitness tools that provide many benefits to your body. They keep you fit on a holistic level, and the fact that they're both affordable and are easily set up means that they can help you develop a fitness regime right in the comfort of your home. So, let's take a quick look at the product's fitness benefits. Weight Loss And Fitness Maintenance - Rebounding exercise is much more exciting and effective than other forms of cardio like jogging. You tend to burn more fats, and the exercise, in general, is much more rewarding to the body as a whole. Also, moderate rebounding will help you breathe comfortably and it gets you moving without stressing your metabolism. Increasing Bodily Lymphatic Flow - The lymphatic system helps the body to be rid of toxins. However, unlike other systems, this one relies on the movement of the body as a means of pumping itself. This is why rebounding is so crucial to its development. Trampoline rebounding works on the entire body, and engaging in it regularly would improve the efficiency of the lymphatic system. Help To Cleanse The Body - Rebounding exercises can detoxify the body. Rebounding helps you to achieve a weightless state on each jump, and this change in gravity helps every cell and muscle that works within the body. Boosts The Immune System - The lymphatic system is actually an essential part of the body's immune system. By promoting the lymphatic system's functionality, trampoline exercises ensure that the immune system functions properly. Gets Rid Of Cellulite - Cellulite is developed when the body has a slower flow of lymph throughout the body and accumulation of dangerous toxins. When you engage in jumping exercises, your body enhances the flow of lymph and improves blood circulation around the body. Strengthens The Bones And Improves Bone Mass - When you rebound, you increase the G force on your bones which improves their strength. Trampoline exercise will also go a long way in strengthening bone density, which is critical for preventing diseases such as osteoporosis.